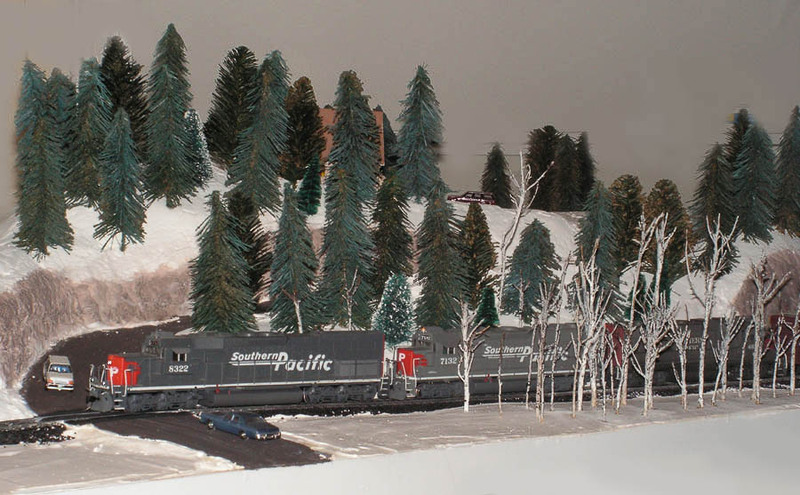 My model railroad is based on the Moffat Road’s line between Denver and Winter Park. I operate multiple eras between say 1962 and the present day, depending on which suite of rolling stock I place on the layout. To represent such diverse history, I must roster equipment from the Rio Grande, Southern Pacific, Union Pacific, Burlington Northern, BNSF, and even some Santa Fe (plus a few lease units). And that’s just the motive power; rolling stock includes a typical (and prototypical) mix of cars that would be seen on the Moffat during the chosen period. The idea is to capture the feel of the ascent from Denver to the continental divide. For the real railroad, ascending some 4,000 feet of elevation in about sixty miles is a real operational challenge. In my case, the distances are much smaller but the challenges are similar. For one thing, I don’t have automatic air brakes on my cars! When I constructed the current version of the layout, I implemented a major change in design philosophy. Instead of a continuous loop, the layout is a point-to-point design with a reverse loop at one end. 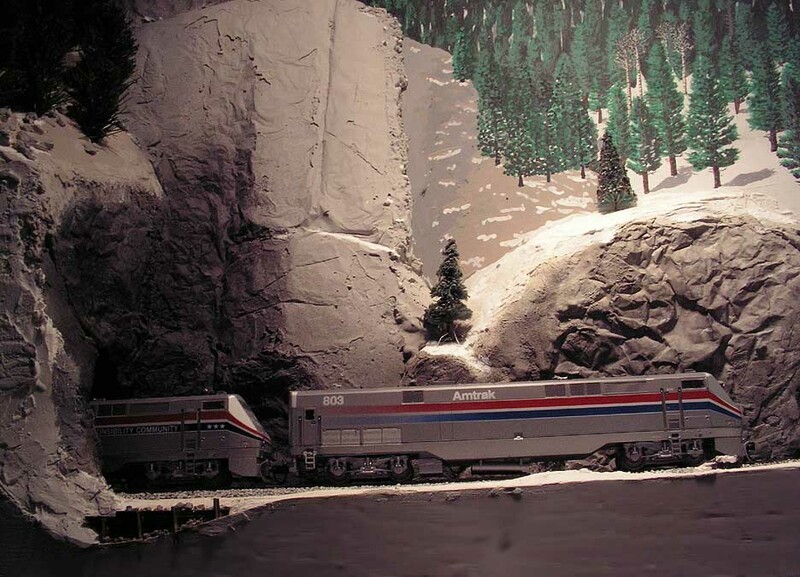 The mainline is single track with sidings, just like the real thing. The layout occupies about half of my garage with a footprint roughly 18′ X 12′. 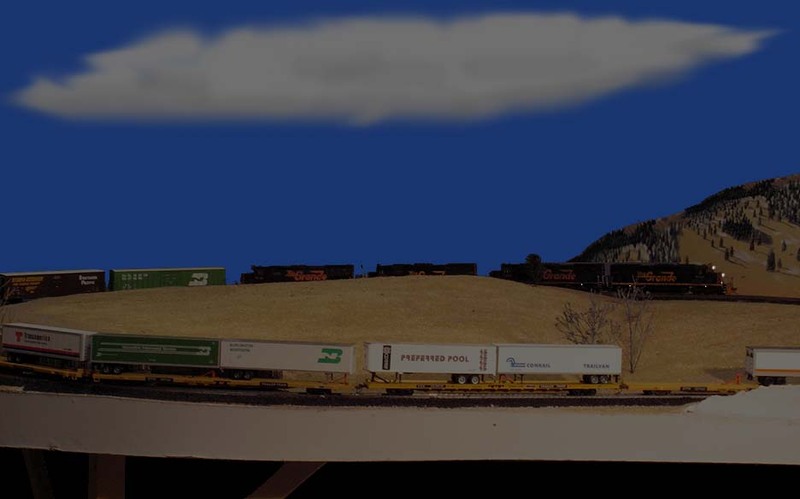 In HO scale, it’s difficult to fit much railroad into a space this size, so I decided to double-deck much of the layout. Since I don’t have a warehouse to build it in, I chose to concentrate on a few selected scenes. Each is separated from the rest by some sort of view block, and arranged sequentially. 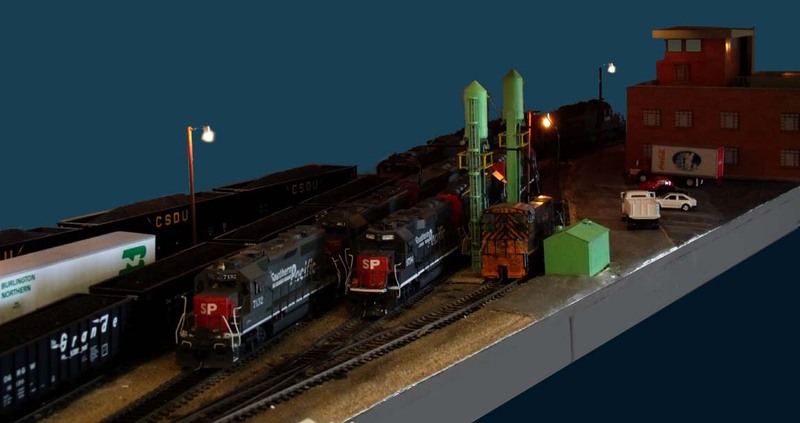 Some of the scenes are fairly large– Denver North Yard and the Big Ten loops, for instance– whereas others are more compact. Also, given the dimensional restrictions and the scale, a considerable degree of compression is required to fit everything in. My compression ratio is roughly 4:1. I didn’t compromise on the ruling grade, which is 2% in places, so some of the tight curves are a bit of a problem with longer, heavier trains. On the other hand, this makes powered helpers something more than a cosmetic feature– I actually need the extra power pushing back there! On the subject of compression: I have taken quite a bit of “modeler’s license” with certain aspects of the scenes. Notably, I have moved Tunnel 27 about a half mile up the canyon so it’s much closer to tunnel 29, and moved Tunnel 30 about 4 miles east so that it’s right next to the bridge at milepost 36.45. On the layout, it makes sense to do it that way. 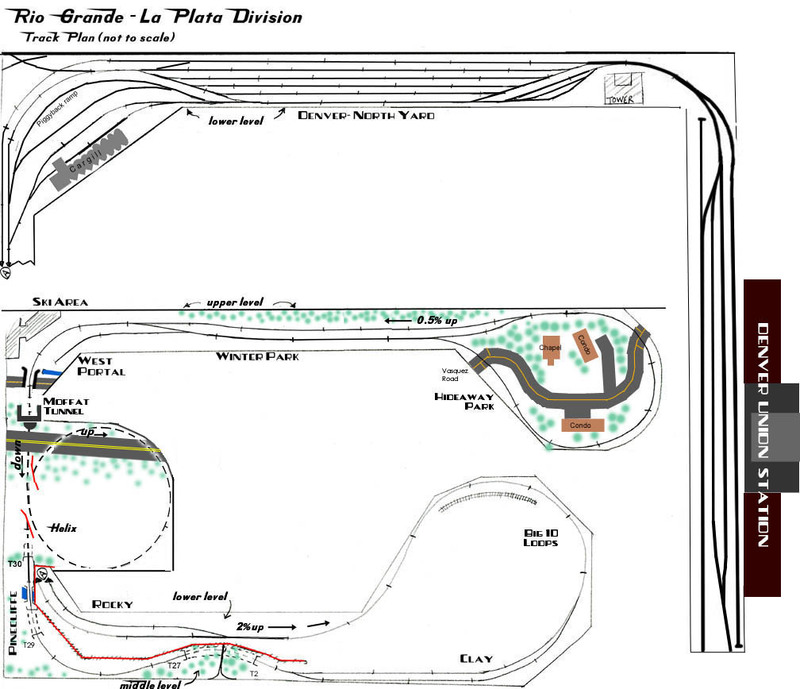 Click Here to see the basic track plan. Starting at the lower end, the route begins at North Yard in Denver. The south end of the yard leads to the Joint line connection (not modeled), and to Denver Union Station and its multiple depot tracks. North Yard itself contains engine servicing tracks, bowl tracks, a piggyback track, and the Cargill elevator. The north end of the yard (RR west) leads to the westbound main line and Rocky siding. After this, the track disappears into Tunnel 30 and transits a hidden helix which represents the Moffat Tunnel. About 15 feet later, the tracks emerge from the West Portal and curve past the Winter Park Ski Area. Winter Park siding stretches down the “valley” to the north.